Nicola Daly's second-half goal earned Ireland a 1-0 win at Mossley in the opening match of their three-Test series against Italy. Daly scored after Shirley McCay's initial shot had been saved following Ireland's first penalty corner. After a scrappy first half, Ireland dominated the third quarter although the home side had to withstand some late Italian pressure. Loreto's Hayley Mulcahy won her first Ireland cap in Thursday's game. 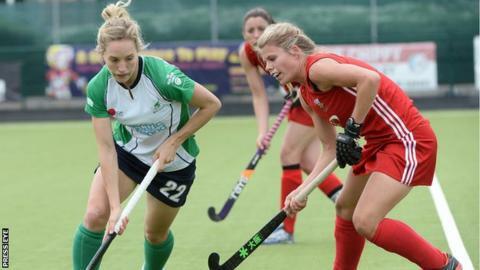 Ireland coach Darren Smith said that he pleased to see his team back in action after their recent World League 2 success. "I thought that we were a bit slow out of the blocks in the first half but started to put together some good passages over the third and fourth quarters," added Smith. The Irish will take on Italy again on Saturday at Jordanstown before Sunday's final Test at the same venue. Both weekend games will start at 14:00 BST.